All ferry schedules and Online Ticket Booking. Since some ferry companies announce their summer schedules in February and afterwards, you are advised to revisit the site for the most updated information. Weather in Naxos and Greece. Forecast up to 6 days. Travel guide to Greece. Hotels and resorts guide & info. A collection of images from Greece. Places and more. 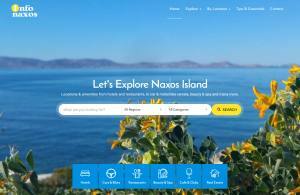 The official site for Olympic Air for flights to & from Naxos Island. The official site of Athens International Airport (Eleftherios Venizelos). Useful information for getting to and off the airport, bus schedules, etc. The official site of Athens Metro (Attiko Metro). Find the way to Piraeus Port.